Blog Home » Retirement TDECU Wealth Advisors » Is Early Retirement a Realistic Dream? Most of us dream of a day when we no longer need to show up to a job on time. A day when we turn off the alarm clock (or toss it out the window). A day when our commute consists of a walk to the kitchen or the garden or the park. For many, retirement is a rich, golden sunset on the horizon. And some may not want to wait until age 65 to get there. There are ways to speed that day along. It takes focus, careful planning, discipline, and likely a bit of sacrifice. Simply put, if you retire before age 65, you’ve retired early. Will you have enough assets to support yourself (and possibly your spouse) over these additional years? A retiree at 55 may be looking at 35 to 45 years of job-free living. Wait until 70, and you’ll need far less in savings at the ready. Since Medicare doesn’t kick in until age 65, you will need to secure additional health coverage to bridge the gap. Professionals in fields with full pensions and health benefits such as military or civil service are more likely to be able to retire at 55. The IRS allows certain workers in these industries to use retirement funds with no penalty even at age 50. For the Social Security Administration, “early” is age 62. If you start taking benefits then, they will be less than if you’d waited until 65, or, even better, 70. If you can retire early but leave these benefits untouched for a while, it will pay off in the long run. You might live longer. 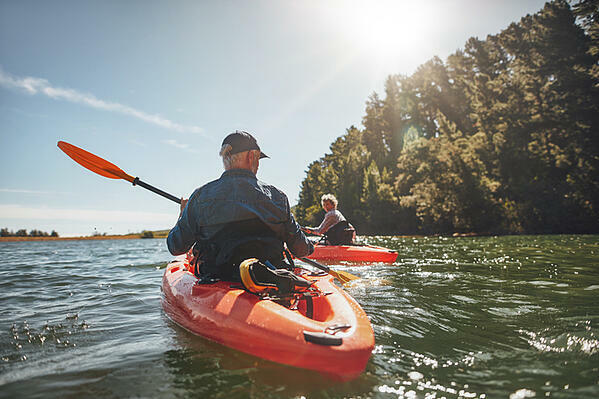 A survey in the U.S. showed that seven years of retirement can reduce the chances of life-threatening illnesses, such as heart disease or diabetes, by as much as 20 percent. These results are mirrored by similar studies in the Netherlands, Israel, Germany, and England. Retirees, on average, exercise more, get more sleep, and participate in more active pursuits like gardening or home maintenance. People also tend to smoke less in retirement. And if boredom creeps into your retirement bubble, never fear. If you miss being in the thick of things, why not freelance, as 16 million people age 55 and up did in 2017? It’s never too early to plan for retirement, and that is certainly true if you hope to do it early. Get started. Put together a retirement budget that includes daily expenses and discretionary spending, including food, healthcare, auto repair, and travel. Next, run those numbers against inflation, longevity, taxes, and surprise expenses to estimate what your life will cost in the future. Compound interest works in your favor, so save early and reap the rewards later. Reduce your debt. The less you owe to a bank or another lending institution, the more you will have in retirement. Shift your risk. Consider annuities as a way to manage your longevity risk. Money spent now on these investment vehicles provides guaranteed income later and reduces the stressful possibility that you might outlive your savings. Create revenue streams and passive income. In today’s “gig economy,” it’s easier than ever before to spin your full-time occupation into additional revenue on the side. Also consider investing in real estate or other sources of passive income. Don’t forget taxes and penalties. Know your tax bracket and what bill is coming upon retirement, particularly if you hold savings in pretax IRAs. Taxes should be integrated into your retirement budget alongside cash flow and expenses. What may you need to give up? Early retirement has its benefits but may also require some sacrifice. Your ideal home. If you had hoped to spend your later years in an epic beach house or swanky urban condo, you may need to adjust your expectations. Housing will usually take the biggest chunk of your budget, along with utilities, repairs, and taxes. Your ideal ZIP code. Housing costs will again be high if your dream location is in a pricey city or idyllic suburb. Other cost-of-living expenses will also push your budget, such as food, taxes, and transportation. If you have an alternate location in mind with a lower cost of living, the sooner you relocate there, the more savings you will accumulate. Your ideal car. Your fantasy of speeding down the highway in a new car every few years may need to remain just that. Automotive expenses like high insurance premiums, registration fees, and (again) taxes can pile up. If your current sedan or soccer-mom-mobile is still going strong, hold onto it and keep those funds aimed toward retirement. Time and tools can help. Early retirement is an aggressive; ambitious; and, with the right mind-set and steadfast reserve, achievable goal. There will be some sacrifices, some changes in direction, but with fiscal discipline and the proper tools, that golden sunset will be within reach.